Quite often when people try to teach grammar, they make one or two things hard for themselves, and their students. One of these is thinking that in order adequately to analyze a grammatical structure, you need to label its component parts, particularly using jargon or technical terms. Let’s assume that students need to know two basic things about any given new structure in order to start to use it: what it means and how it’s made (we could add how it sounds, but that’s a kind of subclass of how it’s made, so let’s leave that for now). Let’s further assume that what it means has already been clarified and understood. The next job for a teacher is to help the students understand how to construct this structure, how to replicate it. For many teachers, this begins with an example sentence on the board (e.g. I have been to India), which they then proceed to break into its component parts, labeling them as they go along: subject – auxiliary HAVE – past participle/3rd form verb. The process is usually repeated for the three basic structural variations: positive utterance, negative utterance, interrogative utterance. In a “student-centred” classroom, instead of the teacher simply declaring this information, the students may be involved in this process, with the teacher pointing at each item in the example in term, and asking “and this is (the)…?”, in the hope of eliciting these technical labels from the students. This approach is frequently successful in eventually generating a formally accurate analysis of the target structure, but it tends to take a long time, be quite repetitive in terms of the information elicited, and crucially, it does not seem to contribute a great deal to students actually performing any better in subsequent controlled practice. There may be many reasons for this, but for now I’d like to simply ask why it is that teachers, especially novice teachers or those on initial training courses, feel that this kind of thing is necessary at all. Firstly, and most obviously, it is because a candidate’s ability to “clarify meaning, form and phonology to appropriate depth (criterion 2e in the Celta framework) is something they are expected to be able to do and must therefore demonstrate. But there is nothing in this criterion that demands a labeling of form, merely a “clarify(ing)” of it. So if using jargon is unnecessary for assessment purposes and ineffectual in revealing useful patterns, what alternatives to it are there? One is to think in terms of drop down menus, like a computer program menu bar. At each point along the utterance, imagine a drop down menu opening up wherever there is something that could be varied or exchanged for another example of the same type. So, taking our earlier example, and assuming the various personal pronouns are already strongly acquired, our attention would stop first at HAVE, and we would open up a drop-down below this to include HAS. Then, when we move to the main verb, here in its past participle form, we open a drop down list and add 2-3 further examples (say climbed Mt. Everest/gone shopping in New York/eaten lobster/worked for an international company) By choosing 2 regular verbs and 2 irregular verbs, we present adequate data to suggest the underlying rule of form, which we can then check with simple questions, unless we haven’t already tacitly done so by eliciting the participle form from students by cuing with the base form, thus killing two birds with one stone. Once the positive form has been unpacked in this way, the negative only requires those slots to be covered that are different. So in our example, we only have to establish a slot for the negation – all else remains equal so there is no point in ploughing the same furrow over and over again. The same applies for the question form – once the inversion has been established, the work is essentially done. In this way, an analysis of form should usually be a matter of diminishing detail, rather than increasing. Once students have noticed the kind of thing that needs to go into any given slot, assuming they are clear about the overall meaning that the completed structure conveys, there is no need for them to know or to enunciate the technical label for it. Much like competent drivers have little to no idea what most of the technical markings on the roads are called, they are still able to respond to and interact with them perfectly safely and effectively. By providing 3-4 possible utterances, we are adding to students’ resources in a useful way. These utterances can be put to use in controlled practice or communicative practice later in the lesson, if well chosen, and thus serve at least a double purpose, of illustration and arsenal. While I appreciate the elegance of a syntactic tree diagram as much as the next man, I’ve never found them especially useful for learning language, because they look so little like language doing its normal thing. A straightforward set of examples, with the key elements highlighted and presented so that the patterns stand out works much better for me, and I suspect for most people. So if you are one of those teachers who, like me, sometimes feels like the focus on form stage in a lesson gets a bit too abstract for anyone’s good, then give this a try and see how it works for you. Any comments, queries, disagreements or death-threats, feel free to leave a comment below. In the next episode, I’ll be talking a little about some of the challenges in understanding published materials, and how to overcome them. Til next time, this is Anthony Gaughan, for Teacher Training Unplugged Radio, saying thanks for listening, and goodbye. In this 15 minute episode, I talk about my teaching career and the developmental opportunities it has afforded me along the way. I recorded this mainly for my current trainees but if you like what you hear, give it a thumbs up, or leave a comment. I took a few minutes to record some thoughts about the past week on my current Celta course for my trainees, focusing on the question of what makes good controlled practice. I focus mainly on the problem of making controlled practice more than a mechanical exercise, and how to make it easier to check whether students really understand what they are doing. It’s under 8 minutes long, audio only, so make yourself a cup of tea and let it run in the background. If you find this useful, give it a thumbs up, and feel free to leave a comment. Or just do the old fashioned thing and talk to me about it on Monday! I just made a short podcast for my current Celta trainees up here in Hamburg, where I talk a bit about our general approach to training, teacher talk, language grading, task-setting, work management (less generally interesting unless you are on the course) and tips for passing the Focus on the Learner assignment (these tips may be generally useful for anyone). It was recorded for a very select audience (you eight people know who you are! ), but perhaps it’s interesting for anyone who likes reading my posts. I’d be interested to hear what you think if you give this a listen (especially about whether you would like an audio version to accompany any future blogposts), so drop me a line if you do! Back in September, I was honoured to be invited by Varinder Unlu to give a short talk for her colleagues at International House London about unplugging teacher training. IH London record these sessions and so – thanks to their efforts and the magic of the internet – I can share this with you all! Huge thanks to Varinder and all of her colleagues who showed up, took part and made me feel welcome. You can also find the video and a short synopsis over at the IH London Blog. It is with some shock and no small degree of shame that I realised it has been that long since my last post here. It was a great honour to be invited to give a talk at this event, held in Greenwich, UK last February. As far as I could tell, my talk on the Se7en Deadly Sins of ELT went down well, and provoked some robust debate as well. Thanks to Shaun Wilden for asking me to be part of this event. One of the fun challenges of the weekend was in Shaun’s and Niki Fortova’s own workshop, where the team I was on managed to film, edit and publish the following short movie trailer in a stupidly short period of time – great idea for class work. If I manage to get permission from all those in the film, I’ll post it here later. I’m also honoured to be part of the TDSIG Pre-Conference Event at IATEFL Manchester 2015, kicking off this coming Friday. The theme revolves around sharing and solving problems and issues we are encountering in our teaching, and revealing and reveling in the rewards of our work. Come along if you can – I think there are still tickets available that you can get early on the day if you are lucky. I’ve also added a short Q and A video with me about Celta that we filmed a few years back. There are a few more housekeeping chores I plan to do shortly, such as repair broken links to some video content, and try to make available again the video of my and Izzy’s talk at IATEFL Harrogate back in 2010. The British Council, understandably, have mothballed that year’s IATEFL Online content, and so the video of our talk and interview have disappeared. I want to see if I can get permission to upload it under my own steam, but we’ll have to see. 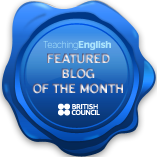 Instead of writing anything for my own blog this month, I’ve had the honour and the pleasure of writing a guest post as part of the ongoing “10 Books that Shaped my Teaching” series initited by TDSIG, the IATEFL Teacher Development Special Interest Group. If the idea of finding out what kinds of books have influenced me as a teacher, and if you want to find out what lessons I drew from writers and books ranging from Douglas Adams to Everyday Zen, then follow this link! Grades have become so closely associated with education these days that is is quite easy to forget that they are – historically speaking – a relatively recent phenomenon. They were unheard of in the days of Socrates, and would have seemed alien to Comenius. Unbelievable as it may sound, we didn’t always bother with grades while going about the task of educating and becoming educated. If you search the internet using this question as a search term you find at least 37,000 hits, and the hits generated are interesting reading for those of us working in education. I suspect, however, that these answers are not really important for the simple reason that they are answering the wrong question. We shouldn’t be asking what grades are for; we should instead be asking who grades are for? I spend almost all of my professional life doing one of two things: observing the work of trainee teachers on Celta initial teacher training courses, or observing the work of Celta tutors in my role as an appointed Assessor for the Celta award. Answering the question of whether or not a lesson being taught by a trainee teacher is any good, or whether or not a training course being run by a team of teacher trainers is any good, is obviously not as straightforward a question to answer, as it is to pose. Where are all the unplugged teacher trainers? Dogme ELT has been around (in the sense of having a name and a movement of people who recognize it as a legitimate and defined approach to teaching languages) for the best part of 15 years at this point of writing; what this means is there are a significant number of teachers working now who never experienced a world of ELT without Dogme – for the simple reason that they entered the profession, were trained, and developed their careers after the emergence of what has been termed the Dogme collective. However banal this observation may appear, its significance is worth exploring.